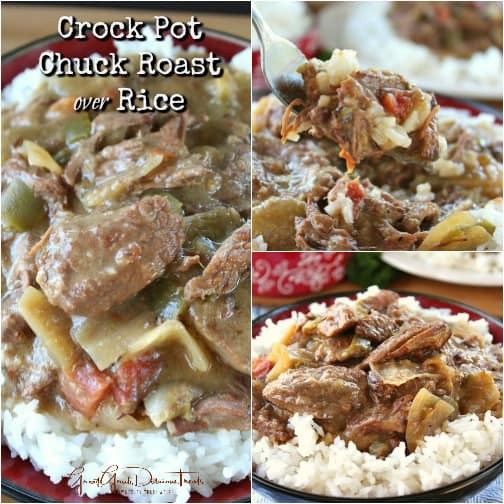 If you’re like me, my crock pot gets used all year long. 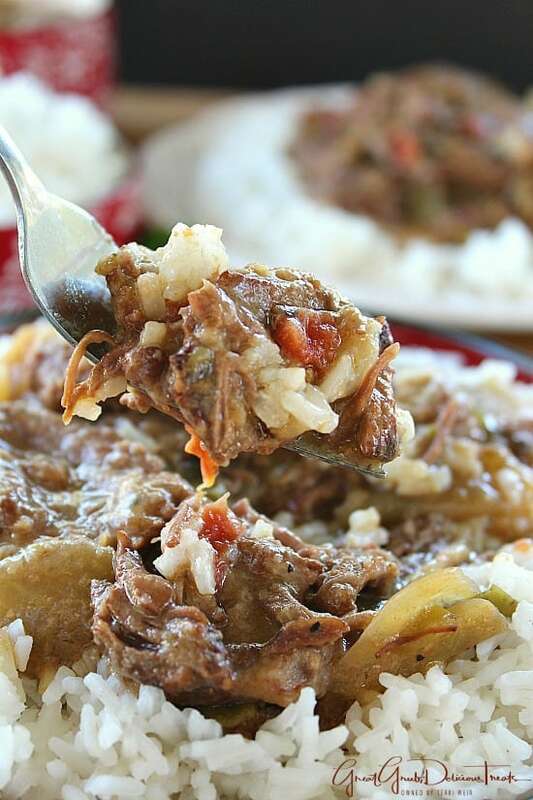 It’s such a convenient and super easy way to cook delicious tasting meals like this crock pot chuck roast over rice. 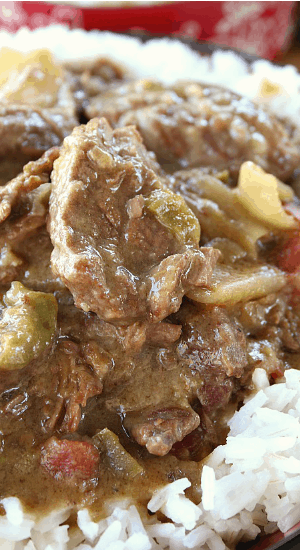 A great comfort meal that everyone will love. The flavor of the roast is awesome! Instead of having a large roast, I decided to cut it up into nice chunks prior to cooking in the crock pot. So grab a large size baggie and place flour, garlic salt, slap ya mama seasoning and pepper into the bag, then seal and shake it to mix. Slice the roast into approximately 2 inch long slices, about 1/2 inch thick and add the meat to the flour mixture. Seal and shake until the meat is well coated. Cook in a large frying pan with a little oil until browned on both sides. There are times when I will just put the meat into the crock pot without browning, but for this recipe, I browned the meat first. Once the meat has browned, add it to the crock pot on top of the chopped onions and bell pepper. I always put the veggie in first and then set the meat on top. Next add garlic, sprinkle with additional salt, pepper and garlic salt, add Rotel®, diced green chilies, vegetable broth and soy sauce on top of the roast, cover and cook on high for 6 hours. As this is cooking, the aroma is fabulous! 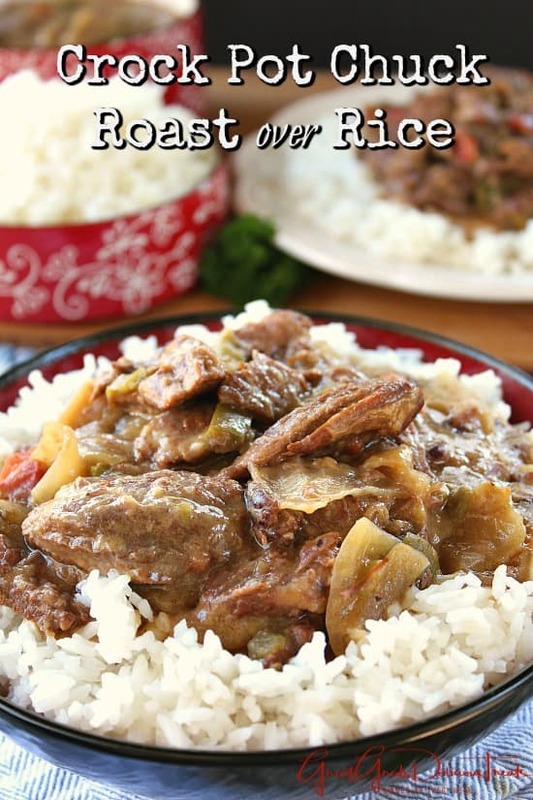 This is a great tasting meal that goes great with both rice or mashed potatoes. Either one works well. Also, if there are any leftovers, this makes great tasting burritos. Just add the rice and meat to flour tortillas, top each one with some cheese, green onions and cilantro, roll up and enjoy! So good! Here are a few more delicious crock pot meals that are on the blog: Crock Pot Cheesy Chicken, Crock Pot Pork with Mashed Potatoes, and Crock Pot Green Chile Enchilada Chicken just to share a few. 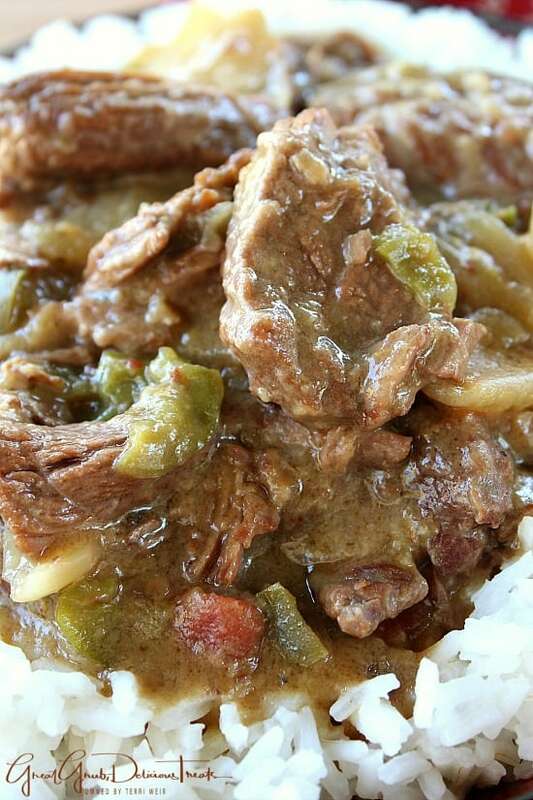 Check out all my crock pot/slow cooker recipes. In a large baggie, place flour, garlic salt, slap ya mama and pepper. Seal and shake to mix. Slice roast into approximately 2 inch long slices, about 1/2 inch thick. Add meat to flour mixture and shake until well coated. Cook meat until browned on both sides. Turn a large 6 quart crock pot to high. Add chopped onion, garlic, bell pepper to bottom of crock pot. Next, place cooked meat in crock pot. Sprinkle additional salt, pepper, garlic salt on top of meat once placed in crock pot. 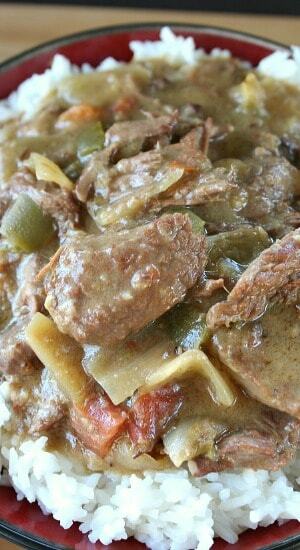 Pour Rotel®, diced green chilies, vegetable broth and soy sauce into crock pot. Cover and cook on high for 6 hrs. When the meat is almost done, cook rice according to package directions. 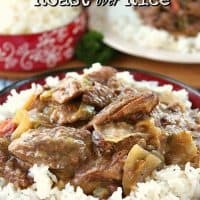 Serve roast slices over rice and enjoy!